Keri, Marcus's roommate, suggested the three of us, along with their other two roommates, Alyssa and Brian, go to Curry-Ya tonight. I've gone with Marcus, Keri, and her boyfriend a month or so ago, and we found the curry dishes offered to be quite tasty (ugh, I hate using this word so much, but it seemed perfect here). But before I continue, props to Derek once again for another great hidden gem recommendation! 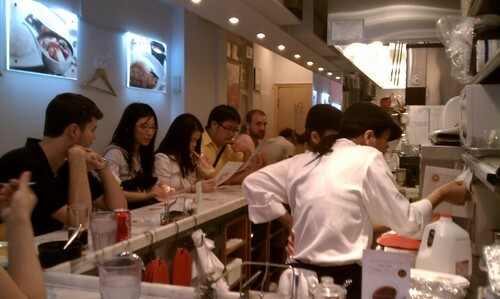 Inside Curry-Ya, sitting along the counter (from left to right): Marcus, Keri, Alyssa, and Brian. Very casual dining, as you can see. This is the Japanese classic curry with beef (which I believe are short rib chunks, yum! ), potatoes, carrots, green beans (not noted in menu), red peppers (also not noted in menu) and acorn squash (which I think is mistakenly described on the menu as "pumpkin"). The curry kitchen chefs bring out a silicone trivet (as seen as the ridged orange item above) and a stainless steel ladle, followed by a piping hot cast-iron pot of thoroughly stewed curry. They braised the beef with so much flavor without overdoing it. It was not over-salted--definitely a major, major plus! The consistency and amount of spice was pretty much perfect--not overly thick and overly zinged with spice, which is what usually disagrees with my stomach. 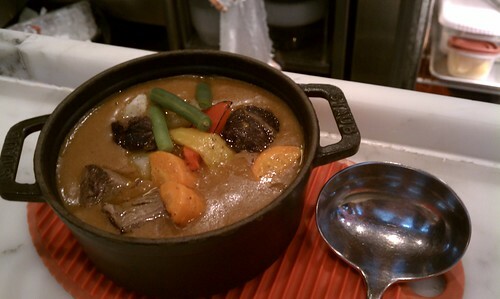 This Japanese style curry stew of beef and assorted vegetables made for a very good compliment with plain white rice, included with all curry orders. I shared this, along with an order of the next dish below, with Keri and Alyssa. The portions aren't necessarily big, but neither one of us wanted ourselves with curry (I mean, we did want to head to Dessert Club, ChikaLicious afterwards :D)! 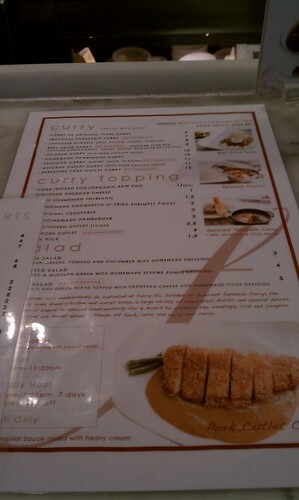 Brian and Marcus also ordered the Berkshire pork cutlet curry (as "recommended" in menu above). The pork cutlet, tonkatsu, was prepared katsuretsu-style, where the protein is seasoned with salt, pepper, and light flour, dipped into beaten egg, and then finally coated with breadcrumbs called panko before being deep-fried. 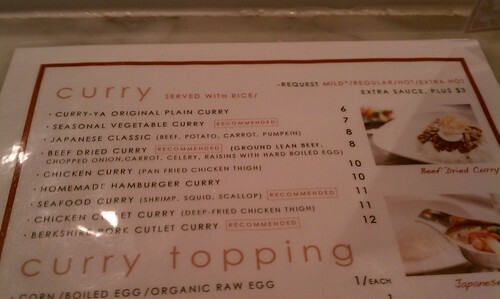 The above photo is of Marcus's order, as he added a "curry topping"--a hard-boiled egg. He made made sure to include it and adjust the aesthetics accordingly before letting me take this photo. I think he's starting to catch onto this food blogging business! Anyway, I'm not entirely sure why we didn't order more than one "recommended" curry dish. During my first visit, we collectively ordered 1 Berkshire pork cutlet curry ("recommended"), 2 Japanese classic curries, and 1 seafood curry ("recommended"), so we didn't really venture out the second time around. However, that isn't to say that it wasn't great! 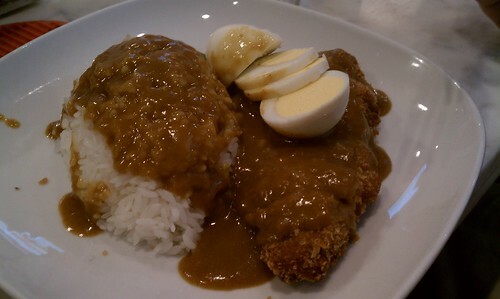 The breaded coating of the pork cutlet was light and very crispy that even when the curry was poured over it, mixed in with rice, and eaten, the crispiness was not compromised in any shape or form. Since I shared the Berkshire pork cutlet and Japanese classic with Keri and Alyssa, it was a good combination of a crispy protein with an ingredient-dense curry stew. The curry served with the pork cutlet was just straight curry with no vegetables or other protein, so the Japanese classic was a nice addition to have served with it. 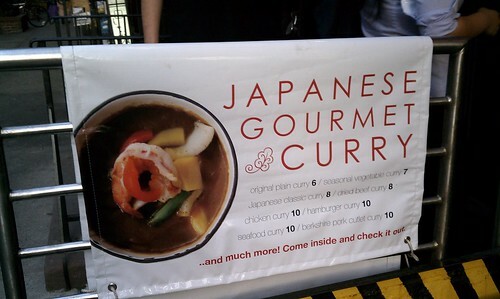 Findings: Overall, Curry-Ya has a really flavorful selection of Japanese curry. I don't think you can really go wrong with any of its menu offerings (with an exception of maybe the original plain curry, which seems to be a misnomer, because you'd think original would imply that it's what Curry-Ya is famous for, but it's actually just plain curry, with nothing in it or on it, served with white rice). Since curry is usually filling (I mean, really depending on how hungry you are), I recommend sharing a couple curry dishes with 2-3 people, so you can taste different braised ingredients, while not feeling too full. Plus, there's always room for dessert at Dessert Club, ChikaLicious a few doors down! 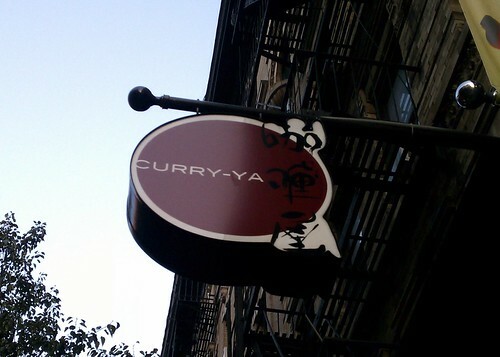 But any dishes from Curry-Ya will be perfect for a cold winter day. It's a pretty small space, so I recommend going with a small group to ensure they can accomodate you! Price point: $8-$12 each curry platter; $2-4 for soft drinks and other beverages.